The Gulf of Tonkin Incident was a pair of alleged attacks by North Vietnamese gunboats on two American destroyers, the USS Maddox and the USS C. Turner Joy, in August of 1964 in the Gulf of Tonkin. Later research, including a report released in 2005 by the National Security Agency, indicates that the second attack did not occur. The Tonkin incident occurred during the first year of the Lyndon B. Johnson administration — less than a year after the Kennedy assassination. While Kennedy had originally supported the policy of sending “military advisors” to Vietnam in an “advisory role”, he had begun to change his thinking and shortly before his death in November 1963, he had begun limited recall of American forces. Johnson’s views had been likewise complex, but had supported escalation in Vietnam as a means to challenge Soviet-Communist expansion in a policy called “containment”. 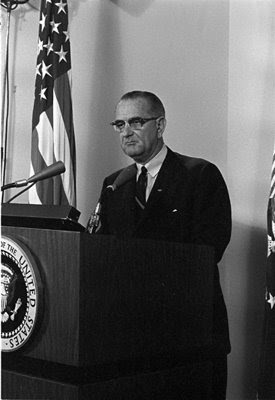 After Kennedy’s death, Johnson would order more forces to support the west-allied South Vietnam government, beginning the United States’ protracted presence in Southeast Asia. On July 31, 1964, the American destroyer USS Maddox (DD-731) began a reconnaissance mission in the Gulf of Tonkin and was attacked by three North Vietnamese patrol boats, in international waters, on August 2, 1964. Admiral George Stephen Morrison was in command the local fleet from his flagship USS Bon Homme Richard (CVA-31). The Maddox, suffering only superficial damage by a single machine gun bullet, retired to South Vietnamese waters where she was joined by the destroyer C. Turner Joy. On August 4, a DESOTO patrol to North Vietnam coast was launched by Maddox and the C. Turner Joy. The latter received radar and radio signals that they believed to signal another attack by the North Vietnamese. For some two hours the ships fired on radar targets and maneuvered vigorously amid electronic and visual reports of foes. It is highly unlikely that any North Vietnamese forces were actually in the area during this gunfight. Captain John J. Herrick even admitted that it was nothing more than an “overeager sonarman” who “was hearing his ship’s own propeller beat.” However, at the time most of the crew had believed they were under attack. Also in 1995, General Vo Nguyen Giap, commander-in-chief of North Vietnamese forces at the time, disavowed any involvement with the August 4 incident, though he did confirm the August 2 attack. With fresh evidence now available, claims that the Tonkin Gulf incident was deliberately provoked gain new plausibility. The claim that the administration of President Lyndon Johnson deliberately triggered the Vietnam War by orchestrating the Tonkin Gulf incident and duping Congress is not a new one. Two recent books–Sedgwick Tourison’s Secret Army, Secret War (reviewed in the February 1997 Vietnam) and Dr. Edwin Moise’s Tonkin Gulf and the Escalation of the Vietnam War–and other new revelations may indicate, however, that the claim is certainly more plausible than could once be proved. Thirty-three years after the fact, modern Tonkin Gulf researchers pointedly ask: Did the United States intentionally instigate the first attack on USS Maddox in the Gulf of Tonkin on August 2, 1964? Did Hanoi actually order a second attack on Maddox on August 4, 1964? And, if the Communist Vietnamese did not launch this second attack, then did Secretary of Defense Robert S. McNamara knowingly and deliberately mislead the U.S. Congress to obtain support for what would become the Tonkin Gulf Resolution, to ensure President Johnson’s re-election and ultimately lead the United States into war? The story of former South Vietnamese special operation forces, part of an American covert intelligence effort known as Operation Plan 34A (or 34 Alpha), is finally coming to light. Details about the plan are now available, thanks to the release of once-classified documents and disclosures by former Central Intelligence Agency (CIA) and military intelligence officials. When Hanoi officially switched its reunification strategy to one of armed conflict in 1960, the Communists, through infiltration, began to build an organized regular force that threatened the American-backed Saigon regime in South Vietnam. In 1961, hoping to undermine the Communist Vietnamese government in Hanoi, the CIA initiated a joint sea-land covert special operation with the South Vietnamese government to dissuade Hanoi from its infiltration activities. The CIA­South Vietnamese covert force conducted airborne, maritime and overland agent-insertion operations. South Vietnamese covert operatives were to gather intelligence, recruit support, establish bases of resistance and carry out psychological operations behind enemy lines. The maritime operation began as an infiltration operation. But beginning in June 1962, with the loss of the vessel Nautelas II and four commandos, it evolved into hit-and-run attacks against North Vietnamese shore and island installations by South Vietnamese and foreign mercenary crews on high-speed patrol boats. While some infiltration operations had some initial successes, such successes were few. The CIA suspected the North Vietnamese were capturing and attempting to turn the agents immediately upon their arrival. By the end of 1963, a National Security Council Special Group, the staff of the special assistant for counterinsurgency and special activities of the Office of the Secretary of Defense, and the CIA were all apparently aware that the covert attacks were unproductive. According to former Secretary of Defense Robert McNamara, “It accomplished virtually nothing.” But the operation was not discontinued. According to Tourison, by January 1964 McNamara had taken over the operation from the CIA, and it became known as 34 Alpha. Now in charge, the Pentagon assumed that the overwhelming majority of the airborne commando agents either had been killed or captured or were working for their captors, the Communist North Vietnamese. Although it appeared that the program had been compromised, new agent teams continued to be recruited, trained and inserted into North Vietnam. By August 1968, approximately 500 of these men were presumed lost. In his book, Tourison poses an interesting question: Were these teams of commandos deliberately used initially to push Hanoi into war and later to test U.S. communications security, or were they simply victims of effective North Vietnamese counterintelligence operations? The answer lies in the story behind what were known as the U.S. Navy’s DeSoto patrols. DeSoto patrols were U.S. naval intelligence collection operations using specially equipped vessels to gather electronic signals intelligence from shore-and island-based noncommunications emitters in North Vietnam. By August 2, 1964, the Communist Vietnamese had determined that the DeSoto vessels were offshore support for a 34-Alpha operation that had struck their installations at Hon Me and Hon Ngu some 48 hours earlier. In retaliation, the North Vietnamese then conducted an “unprovoked attack” on Maddox, which was approximately 30 miles off the coast of North Vietnam. During the battle that ensued, one North Vietnamese patrol boat was severely damaged by Maddox, and two others were attacked and chased off by U.S. air support from the carrier USS Ticonderoga. On August 4, 1964, Maddox and USS C. Turner Joy reported a second attack, this one occurring within 17 hours of 34-Alpha raids on North Vietnamese facilities at Cap Vinh Son and Cua Ron. On that day the National Security Agency (NSA) had warned that an attack on Maddox appeared imminent. An hour after the NSA’s warning, Maddox claimed that she had established radar contact with three or four unidentified vessels approaching at high speed. Ticonderoga soon launched aircraft to assist Maddox and C. Turner Joy. Low clouds and thunderstorms reportedly made visibility very poor for the aircraft, and the pilots never confirmed the presence of any North Vietnamese attackers. During the next several hours, the ships reported more than 20 torpedo attacks, the visual sighting of torpedo wakes, searchlight illumination, automatic-weapons fire, and radar and sonar contact. Despite the recommendation of Captain John J. Herrick, the recently assigned senior officer on board Maddox, that the circumstances–including darkness, stormy seas and nervous, inexperienced crewmen–warranted a “thorough investigation,” Secretary of Defense McNamara told Congress there was “unequivocal proof” of the second “unprovoked attack” on U.S. ships. Within hours of McNamara’s revelations, Congress passed the Tonkin Gulf Resolution, and the United States plunged into the only war it has ever lost. McNamara’s account, backed by the Johnson administration, did not go unchallenged. Before a joint executive session of the Senate Foreign Relations and Armed Services Committee debating full congressional support for the resolution, Senator Wayne Morse (D-Ore.), who had already dubbed the conflict “McNamara’s War,” declared: “I am unalterably opposed to this course of action which, in my judgment, is an aggressive course of action on the part of the United States. I think you are kidding the world if you try to give the impression that when the South Vietnamese naval boats bombarded two islands a short distance off the coast of North Vietnam we were not implicated.” Senator Morse also noted that the American vessels were “conveniently standing by” as support for 34-Alpha operations. McNamara also claimed that the Maddox crew had no knowledge of the 34-Alpha raids. McNamara now acknowledges that this claim was untrue, although he maintains that he did not know it at the time. Captain Herrick and his crew did indeed know of the 34-Alpha operations. In fact, retired Lt. Gen. Phillip B. Davidson, the former chief of intelligence for the U.S. Army Military Assistance Command, Vietnam (MACV), cites Captain Herrick’s observation that Maddox personnel were extremely concerned that the 34-Alpha operations were putting their ship in harm’s way. Davidson further endorses Herrick’s assessment that this concern may have resulted in an overly nervous crew and unreliable reporting about the second attack in the gulf. The events surrounding the resolution and its passage point to a tragic failure in the U.S. decision-making system of the time. At a crucial moment in history, U.S. intelligence-collection agencies directly fed raw intelligence data to U.S. policy-makers without submitting that data to thorough and proper analysis. The prevalence of this kind of unpolished intelligence support to government leaders helped open the door to full U.S. involvement in the Vietnam War. In 1972, Louis Tordella, the deputy director of the NSA, announced that the decoded message on which the NSA’s August 4 warning to Maddox had been based actually referred to the original attack on August 2. And the “unequivocal proof” of the second attack consisted of decrypted North Vietnamese damage assessments of the first attack (August 2) that were presented to top-level U.S. decision-makers as the alleged second attack was being reported to the Pentagon. According to a U.S. News and World Report exposé, former CIA Deputy Director for Intelligence Ray S. Cline verified this series of mistakes in 1984. Given the extreme volitality and pressure of the situation, the fact that some decision-makers were confused by intercepts suggesting two attacks is understandable. That they acted so quickly on rash assumptions–removing the chance for necessary debate and analysis–added insult to injury in an already untenable decision climate. In his book Vietnam at War, General Davidson points out that Herrick was a combat veteran who realized that the Maddox crew had never before been in combat. He claims that Captain Herrick’s assessment that the “entire action leaves many doubts except for apparent attempt to ambush at the beginning ” remains the most valid summation of the second attack. Understandably, in the United States the Vietnam War as a whole and the Tonkin Gulf Incident in particular remain topics of widely ranging interpretation and debate. McNamara recently visited Hanoi, where he met with Communist Vietnamese Senior General Vo Nguyen Giap. McNamara also invited the Vietnamese to participate in a conference of top Vietnam War decision-makers to, according to press reports of the visit, “correct the historical record.” During his visit, Giap told McNamara that “absolutely nothing” happened on August 4, 1964. McNamara later endorsed this statement by his former adversary. Was this provocation needed to initiate bombing, or to assist the Johnson administration during an election year? Either goal certainly seems plausible. Interestingly, a resolution stating, “Upon request of South Vietnam or the Laotian government to use all measures including the commitment of U.S. Armed Forces in their Defense”–the very resolution that became the Tonkin Gulf Resolution–had been prepared in May 1964, three months before the “unprovoked attacks” ever occurred. At the time, Johnson was running his presidential campaign on a peace ticket. Johnson’s main opponent for the presidency, Senator Barry Goldwater, was pushing for an even tougher U.S. stance in Southeast Asia. An “unprovoked attack” by North Vietnam would give Johnson the opportunity to respond with limited force and improve his image with the American people without appearing to agree with his main political opponent, a man the Johnson administration was busy painting as a candidate who would potentially lead the country into a nuclear war. If this line of thinking was part of Johnson’s plan, it was well-calculated. In response to the Tonkin Gulf attacks, the president launched a limited airstrike and warned Hanoi against further aggression. Thus, four months prior to the November election, he appeared firm but not a warmonger. His approval rating with the American people soared from 42 percent to 72 percent, and within three months he overwhelmingly won his campaign for the presidency. Now that time has passed and some of the individuals involved have re-examined what happened, the shroud of controversy surrounding the events of August 4, 1964, has begun to lift. As mentioned earlier, the former secretary of defense endorses a joint effort with the Communist Vietnamese to discuss and clear up some of the contentious areas of the Vietnamese conflict. This effort may prove difficult and ultimately fruitless unless the Vietnamese decide to be more candid. Care must be taken with Communist Vietnamese versions of history. As a typical totalitarian regime, Hanoi is acutely aware of how it is perceived from abroad. The Communists monitor and often censor what is said or written about them by their own citizens. This sort of information-control policy helps to ensure that their “official” accounts of history are accepted by their populace and go unchallenged. They are quick to accept praise, warranted or not. And they are even quicker to deny fault, deserved or not. About this assertion, Douglas Pike, the foremost U.S. authority on the People’s Army of Vietnam (PAVN), notes, “If the Gulf of Tonkin Incident is a myth created by the Pentagon, as some revisionist historians claim, the PAVN navy is now part of the conspiracy.” In this same history, the Communist Vietnamese claim that their navy sank 353 American naval vessels. It is rational to believe that the number of U.S. Navy vessels lost to a fleet of Communist patrol boats, with a total arsenal of 60 torpedoes, was somewhat less. A U.S. Army military intelligence officer, Captain Ronnie Ford is the author of Tet 68: Understanding the Surprise. Suggestions for further reading: Secret Army, Secret War, by Sedgwick Tourison (Naval Institute Press); Tonkin Gulf and the Escalation of the Vietnam War, by Dr. Edwin Moise (University of North Carolina Press); and Vietnam at War: The History 1946­1975, by Phillip B. Davidson (Oxford University Press).